I love Christmas Day trimmings … sprouts in butter with bacon and lemon; golden roast potatoes; creamy mash; buttered carrots; sweet melting crunches of parsnip; a button-mound of stuffing; pigs in blankets, cuddling a bread sauce cushion, which in turn is gently nudged by a teardrop of cranberry sauce. You might favour turkey, beef, or goose, or a special veggie centrepiece with all those wonderful trimmings. Whatever your choice, it would be daft to pour something horrid into a glass after taking care to make all of the flavours on your Christmas plate perfect. Here are some Christmas Day wines to get you thinking for the Big Day, even if you choose to ignore them. Sainsbury’s Blanc de Blancs (£22.50) has just been voted “best buy” supermarket Champagne in Which? magazine’s annual sparkling taste test. A frizz-frazz huzzah of fine bubbles, with biscuit and brioche aromas and bright citrus flavours with apple and a shy hive of honey. Open this for family as they arrive on Christmas Day or save it to wrap presents, watch The Great Escape and have an occasional fizzy hiccup. Whites might be your choice. Rich Burgundy whites, chardonnays with deep creamy oak character, are a good bet; but my pals don’t like them. So for something more subtle and light, Wolf Blass Silver Label Chardonnay (£12.99, Tesco) has layers of citrus and some minerality. Yes, it has some oak, but it’s not heavy and gloopy. It has enough in its flavour armoury to stand on the Main Course Battlements and take on the parsnips, stuffing and cosy piggy blankets and come out reasonably unscathed. Here’s a white worth seeking out because I’m sharing the love. Morrisons Signature Grüner Veltliner (£6.99) won Gold at last week’s International Wine Challenge gongs and if you’ve not tried this apple-bright grape then why are you waiting. It will probably survive a turkey, but not a richer meat, and will brighten up a veggie main. This wine is a deep magenta, and has an intriguing nose of earth, redcurrant and pepper. With cranberries and more pepper to taste. It might tumble out of the bottle fairly quickly as you eat. Here’s some quick-fire reds to float your gravy boat. The Exquisite Collection Fleurie (£6.49, Aldi) has soft tannins which won’t start a tastebud fight before the Queen comes on, but has peppery bramble flavour spikes to wink at the trimmings. 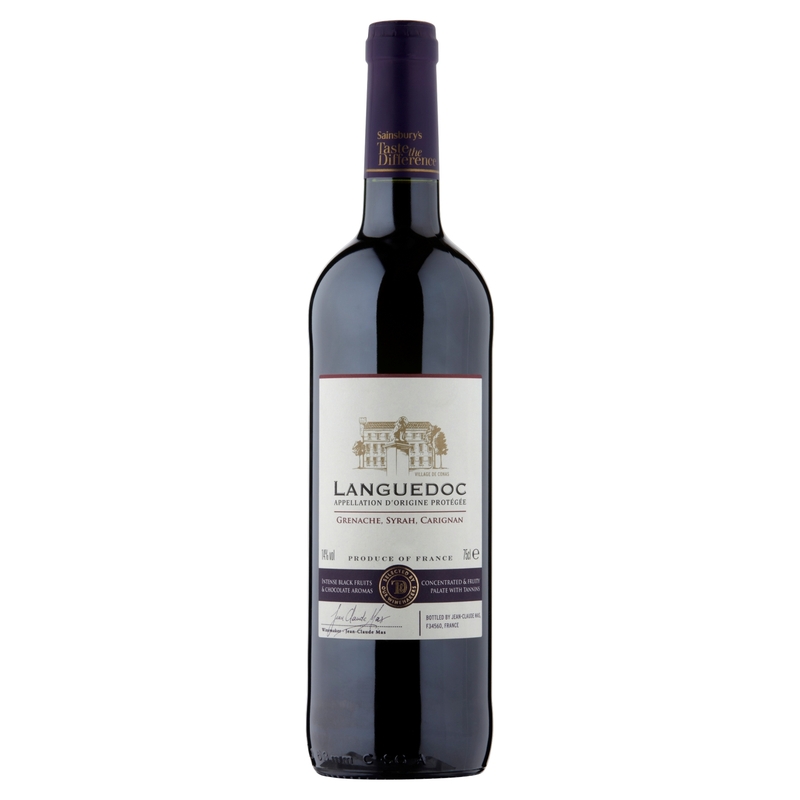 Taste the Difference Languedoc Rouge, (Sainsbury, reduced from £8 to £6 until January 1) is a blend of syrah, grenache and carignan, a cheeky grape trio which isn’t backward in coming forward. This wine is full of black fruit flavours, soft with vanilla and speckled with pepper and dunked with memories of French summer sun. If you like rioja, then Tesco finest* Viña Mara Rioja Crianza (£7.99) is a decent starter for ten. Cherries charm and pepper prickles while clothed in a winter warming vanilla overcoat. This is one for a main with meaty oomph. I’ll be going for pinot noir on Christmas Day. Earthy, fruity, spicy, light – just like me in my 20s. I’ve had a mini pinot noir taste-off; opening Jackson Estate Vintage Widow Pinot Noir, (RRP £19, Majestic, Ocado, thedrinkshop.com, Tesco.com, Rollings Wine Company) and Villa Maria Private Bin Pinot Noir 2013 (RRP £12.99, Asda, Co-op, Morrisons and independents). Both are New Zealand, both with a fab reputation. I’m a huge Villa Maria fan, but for me the Widow edged it. It’s a smoky red fruit delight, with a bright-light squint of acidity and a juicy finish. It might be a widow but it shouldn’t be left on the shelf.